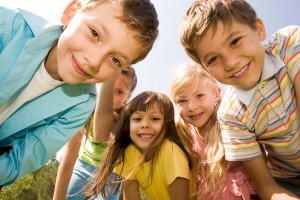 Children need regular dental care, just like adults. But, if you’re a new parent, you might not know when your little one should have his or her first dental appointment. At Complete Cosmetic Care Dentistry, Dr. Mohanna and Dr. Georgy recommend bringing your child in as soon as he or she gets a first tooth. It’s at that point that your child will become vulnerable to cavities and gum disease—the two most common oral health problems any patient can face. Early appointments like these also give our Sapulpa children’s dentists a chance to see how your little one’s smile is developing. Habits like thumb sucking and tongue thrusting can cause problems with misalignment in the future. Treating both early is important for helping children develop straight, healthy smiles. For nutrition and home care, it’s imperative that parents play an active role. Children won’t learn to brush on their own, and they need help choosing nutritious foods. As a parent, you can help your little one build healthy habits from a very young age—habits that will be important throughout life. Is your son or daughter between the age one and four? Has he or she had a first visit with one of our children’s dentist? If not, call Complete Cosmetic Care Dentistry in Sapulpa today. Our office is happy to provide compassionate children’s dental care to patients from Tulsa, Bixby, Glenpool, Jenks, Okmulgee, Mounds, Keifer, and beyond.